What if you could gain impressive strength, build serious muscle, and get ripped with no gym memberships or fancy exercise machines? What if you could do it with anything you have at hand? The Rough Strength Files will share with you 42 useful ideas on getting more with less in regards to strength training, nutrition, and mindset. This book is an organized treasure chest densely packed with knowledge and practical advice on how to make everything work even if you have nothing. *I may get paid commissions if you buy some of this stuff. The thing I’d like you to know is that I will never promote anything I don’t believe in or never tried. If I get any money, I promise to spend it on booze and strippers. This is one of the best books that I’ve read on bodyweight strength training and conditioning. CC was an eye-opener for me. Before reading it, I truly believed that you can gain strength and build muscle only with weights. However, this book taught me that calisthenics can give you the same results as weights if you make them progressive. This book is packed with tons of useful information on how to reach your training goals. Pavel has a straightforward and simple style, thus you will be able to apply the tips and techniques right away. It’s not your average fitness book. Beyond Bodybuilding is years of experimentation and knowledge. In this sequel, Coach Wade reveals how to train smaller but still important muscle groups: forearms, calves, neck and lateral chain. He shares his views on mobility/flexibility and stretching. Also, you will find here his ideas on nutrition and rest, as well as many stories about prisons and prisoners. 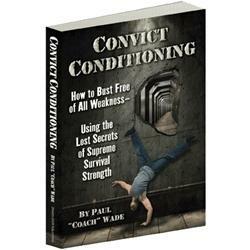 If you like the original Convict Conditioning, it’s definitely a “must-have”. If you haven’t read the first book, I strongly suggest you to start with the numero uno. If you like bodyweight strength training, you should try working out with these bad boys. Gymnastic rings will definitely add more variety and effectiveness to your workouts, as well as new challenges. I use EXF Rings. They are compact, practical, and durable. Of course, they are not wooden, but that’s not a problem for me. It is one of the best DVDs on kettlebell lifting with emphasis on size and strength. If you enjoy kettlebells and want to add muscle to your frame, then it’s a “must-have” for you. In the DVD, you will find lots of exercises suitable specifically for gaining size and strength. Mike is very precise about lifting technique, and the information is very comprehensive. Additionally, everything is flavored with his good sense of humor. In this DVD, Mike shares his knowledge on advanced kettlebell lifting techniques and hormone optimization. You will learn such exotic drills like double swings outside of the feet, double snatches outside of the feet, stacked military presses, etc. Mike will clarify many technique points that will help you in your training. Additionally, the hormone optimization lecture contains Mike’s nutrition and restoration tips.